A dental crown wraps up a tooth to protect it from cracking or splitting in much the same way as a phone case prevents a dropped phone from cracking. 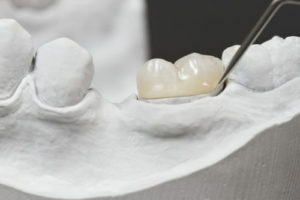 A dental crown is a good solution to strengthen a tooth, when 50% or more of the tooth structure has already been lost. They can also be used to hold together a tooth, which has already badly cracked. Dental crowns are a great way to restore a tooth to a beautiful natural look and feel. There are many different types of dental crowns available, and the best option will often depend on achieving a balance between strength and aesthetics. Modern dental crowns look so natural they are indistinguishable from natural teeth.